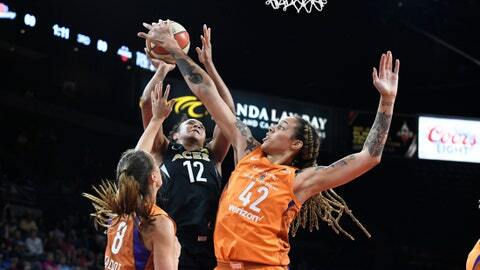 LAS VEGAS — Diana Taurasi scored 18 of her 28 in the first half and the Phoenix Mercury ran their winning streak to eight with a 92-80 victory over the Las Vegas Aces on Sunday night. Las Vegas pulled within six late in the fourth quarter but DeWanna Bonner hit a baseline 3 to make it 85-76 with 1:48 left and Taurasi made three free throws with 1:18 to go. Phoenix (10-3) scored 10 straight to end the third quarter with a 75-59 lead — the Mercury’s largest of the game. Leilani Mitchell had back-to-back 3-pointers in that run. The Mercury took the lead for good with the last four points of the first half to go into the break ahead 46-42. Brittney Griner added 24 points for Phoenix. A’ja Wilson led the Aces (3-9) with 21 points, and Kayla McBride had 20.